By the time Halloween arrived, Harry was regretting his rash promise to go to the deathday party. The rest of the school was happily anticipating their Halloween feast; the Great Hall had been decorated with the usual live bats, Hagrid's vast pumpkins had been carved into lanterns large enough for three men to sit in, and there were rumors that Dumbledore had booked a troupe of dancing skeletons for the entertainment. "My dear friends," he said mournfully. "Welcome, welcome... so pleased you could come..."
It was an incredible sight. The dungeon was full of hundreds of pearly white, translucent people, mostly drifting around a crowded dance floor, waltzing to the dreadful, quavering sound of thirty musical saws, played by an orchestra on a raised, black-draped platform. A chandelier overhead blazed midnight-blue with a thousand more black candles. Their breath rose in a mist before them; it was like stepping into a freezer. "Shall we have a look around?" Harry suggested, wanting to warm up his feet. "Careful not to walk through anyone," said Ron nervously, and they set off around the edge of the dance floor. They passed a group of gloomy nuns, a ragged man wearing chains, and the Fat Friar, a cheerful Hufflepuff ghost, who was talking to a knight with an arrow sticking out of his forehead. Harry wasn't surprised to see that the Bloody Baron, a gaunt, staring Slytherin ghost covered in silver bloodstains, was being given a wide berth by the other ghosts. "Oh, no," said Hermione, stopping abruptly. "Turn back, turn back, I don't want to talk to Moaning Myrtle--"
"Yes. It's been out-of-order all year because she keeps having tantrums and flooding the place. I never went in there anyway if I could avoid it; it's awful trying to have a pee with her wailing at you--"
"Oh, no, Peeves, don't tell her what I said, she'll be really upset," Hermione whispered frantically. "I didn't mean it, I don't mind her--er, hello, Myrtle." "How are you, Myrtle?" said Hermione in a falsely bright voice. "It's nice to see you out of the toilet." Myrtle sniffed. "Miss Granger was just talking about you--" said Peeves slyly in Myrtle's ear. "Just saying--saying--how nice you look tonight," said Hermione, glaring at Peeves. "No--honestly--didn't I just say how nice Myrtle's looking?" said Hermione, nudging Harry and Ron painfully in the ribs. "Not a bad turnout," said Nearly Headless Nick proudly. "The Wailing Widow came all the way up from Kent... It's nearly time for my speech, I'd better go and warn the orchestra..."
Through the dungeon wall burst a dozen ghost horses, each ridden by a headless horseman. The assembly clapped wildly; Harry started to clap, too, but stopped quickly at the sight of Nick's face. The horses galloped into the middle of the dance floor and halted, rearing and plunging. At the front of the pack was a large ghost who held his bearded head under his arm, from which position he was blowing the horn. The ghost leapt down, lifted his head high in the air so he could see over the crowd (everyone laughed), and strode over to Nearly Headless Nick, squashing his head back onto his neck. He gave a hearty guffaw and clapped Nearly Headless Nick on the shoulder. "Welcome, Patrick," said Nick stiffly. "Don't mind Nick!" shouted Sir Patrick's head from the floor. "Still upset we won't let him join the Hunt! But I mean to say--look at the fellow--"
"I think," said Harry hurriedly, at a meaningful look from Nick, "Nick's very--frightening and--er--"
"If I could have everyone's attention, it's time for my speech!" said Nearly Headless Nick loudly, striding toward the podium and climbing into an icy blue spotlight. "My late lamented lords, ladies, and gentlemen, it is my great sorrow..."
The Dursleys were so mean that summer that all Harry Potter wanted was to get back to the Hogwarts School for Witchcraft and Wizardry. But just as he's packing his bags, Harry receives a warning from a strange, impish creature named Dobby who says that if Harry Potter returns to Hogwarts, disaster will strike.And strike it does. 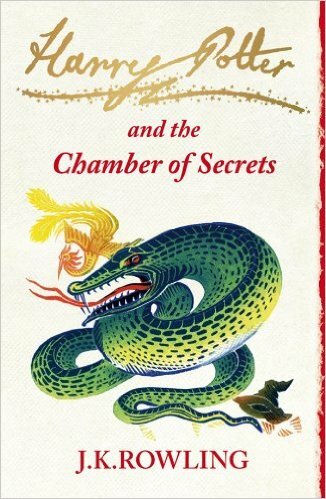 For in Harry's second year at Hogwarts, fresh torments and horrors arise, including an outrageously stuck-up new professor, Gilderoy Lockheart, a spirit named Moaning Myrtle who haunts the girls' bathroom, and the unwanted attentions of Ron Weasley's younger sister, Ginny.